Apple ID. Sometimes just saying that phrase brings fear and confusion to many people. Why do I need one? What if I want to change my Apple ID? Should I have separate ID’s for iCloud and iTunes? 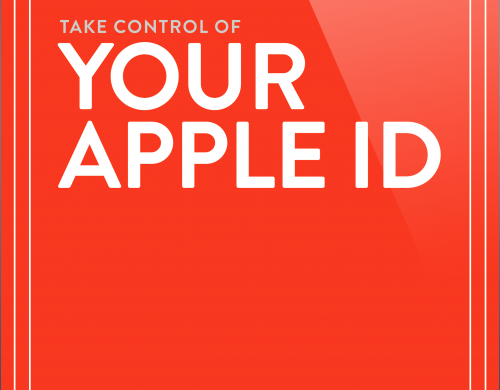 Those questions, and many more, are answered in the new book, Take Control of Your Apple ID. Long time technology writer Glenn Fleishman dives deep into what an Apple ID is, what it’s used for, how to manage one or multiple Apple IDs, and how to troubleshoot when problems arise. He also discusses the history of the Apple ID and why some people have more than one. You need an Apple ID if you use iCloud services, including storage, make any type of purchase though the Mac or iOS stores, and/or have an iCloud email address, plus other important reasons. Creating an Apple ID is simple, but there are rules, especially with using, creating, and changing IDs with iCloud addresses. Fleishman concisely, but thoroughly, explains the process. A subject I know people struggle with is splitting or migrating Apple IDs. Why would you want to do this? Maybe you share your Apple ID with another person and for various reasons you now want separate IDs. Or possibly you want to share contacts and photos but have a separate account for iTunes purchases. Whatever the reason, Take Control of Your Apple ID has you covered. Head straight to the chapter Split or Migrate Apple IDs. Read this chapter slowly, or even out loud. Splitting an Apple ID isn’t simple; a costly mistake can easily occur. If this is your situation, read the chapter, then read it again. Follow the steps deliberately and carefully while taking Fleishman’s suggestions to heart. And, of course, backup all your data before making any changes. Take Control of Your Apple ID includes a chapter on two-factor authentication, another concept that can be difficult to digest but is extremely important in this era of hacking and phishing attempts. Again, read this chapter slowly to learn what 2FA is, how to enable it and log in, and how to manage devices with 2FA. If you’ve ever had concerns or problems with your Apple ID pick up a copy of Take Control of Your Apple ID. For less than $10 it will answer a lot of questions, solve issues, and save readers time and aggravation.